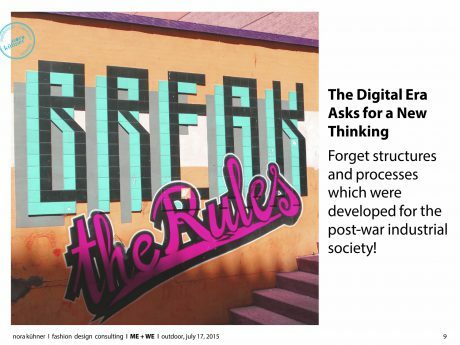 Digital disruption goes along with radical cultural shifts and transformations. Trends, manners and special likings are in constant change. 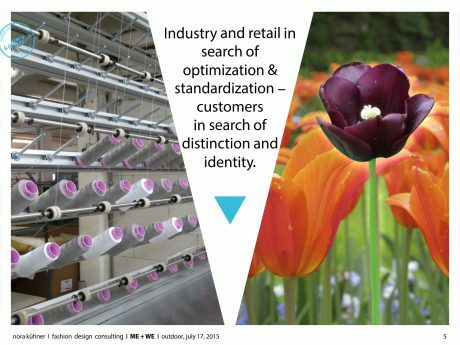 Customers are in search of distinction and identity exploring the many facets of individualization, blurring gender lines, too. Yet besides the focus on the individual we see the renewal of a longing for gathering with friends and family. Despite excessive data mining and intense researches in neuroscience, customers still keep their secrets. The strong hope that comprehensive tracking and analyzing of the customer´s traces in the world wide web will give birth to the final truth about his preferences hasn´t been fulfilled up to now. It is just the opposite: The more we know, the more confusion. The number of tribes and communities is ever growing. The social norms which once defined a few clearly shaped lifestyles have been dissolved. Modern societies are marked by diversity and complexity. 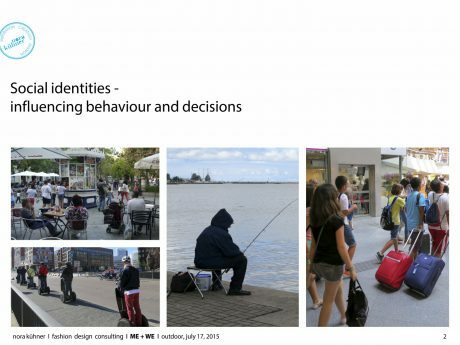 People adapt their lifestyle to changing settings and circumstances with playful easiness. Over the last two decades industry and retail optimized and standardized both structures and products while people discovered the desire to be different and showcase their unique statements and accomplishments. The well-informed and self-conscious customer wants to express personality and edits his own narrative. The wide variety of digital social platforms offers the chance to live and spread multiple identities. High time for the industry and retail to start thinking anew. It is necessary to forget the structures and processes which were developed for the post-war industrial society. Today´s fast pace asks for well-thought ideas and strategies which are realized with contemporary structures and processes. Success in the digital era doesn´t derive from evaluating performance numbers – mainly sales results – as these numbers are always a reflection of the past. In saturated markets the customers are not waiting for the industry to deliver its ideas. When it comes to women´s clothing, a lot of sports brands are in trouble. Women are used to juggle different roles in their lives – friend, wife, mother, business woman – to name just a few. They ask for appropriate products to master this complexity. In clothing “appropriate” is yet not enough. Appropriate function – yes, of course but women want products which make them feel good and look better. And here the problem area in sports apparel starts: The industry and retail have long focused only on improving functionality and protection of the garments. A proper fitting, a sense for fashion and in general a more diverse approach to collections has been given up. A look at women´s preferences in spending money shows that sports apparel is not a favourite item for women. To make it sharp: They like performing sports but they don´t like the product offer, they don´t like the look and fit and they don´t like the marketing stories. Again: High time to think anew. Both industry and retail have to follow carefully the needs and wishes of customers and respond in a proper way. It is necessary to understand how and where people make use of the industry´s products. This is the starting point for any successful product development and communication. The customer wants industry and retail to be companions who offer support, inspiration and orientation for living his individual life. Marketing has to create new storylines and imagery with a thorough understanding of the people they want to hit. New alliances between industry and retail have to be established. Shops don´t need technological overkill just because the gadgets might be cool stuff – a shop has to offer unique experiences in finding the product you have been dreaming of, you want to feel well inside the shop and you want a really good service with a human touch. The perspectives for the sports industry are quite well as performing sports has turned into a firm part of the contemporary global lifestyle. Yet extreme and high-performance sports are just for a small target group. Healthcare and wellbeing sports gain ever growing importance and will be major drivers of sales in the next years. People want to live longer, healthier and happier. Many countries launch already public health programs, making people move in order to reduce exploding healthcare expenses. Today is about breaking sameness, defining a new understanding of sports and its meaning to people. It is about discovering the chances of the broad diversity in society and setting up a true and contemporary brand identity. You want to know to know more? Please don´t hesitate to contact me! Get your individually shaped interpretation and consulting services in the field of sports apparel.